John Riley, Sr. - Descendants of John Riley, Jr.
1. JOHN6 RILEY, JR. (JOHN5, EDWARD4, WILLIAM3, EDWARD2, EDWARD1)1 was born 1795 in Orange County North Carolina1. He married WINIFRED Abt. 1820 in Darlington District, South Carolina. She was born Abt. 1800. The 1820 Darlington County South Carolina Federal Census, roll 118, page 070, list John Riley,Jr, age 16-26 with one female age 16-26. I believe John Junior was the first child born to John Senior and Mary Riley and was born in 1795. The 1830 Darlington County South Carolina Census, lists John Riley, Jr. age 30-40, with 2 females age 20-30, (his wife Winifred and perhaps a sister Joanna) 2 females age 5-10, and 1 male age 0-4. The 1840 Henry County Alabama Census, page 168, list John Riley, Jr. age 40-50 with 1 female age 40-50, 1 female age 16-20, 1 female age 10-15, and 1 male age 10-15. John Jr. has not been found on other Census and no record exists on him after 1840.
i. WINIFRED 'WINNIE'7 RILEY, b. 12 Sep 1820, Darlington District, South Carolina; d. 10 Feb 1840, Henry County Alabama. Direct proof that Winnie is the Child of John Riley, Jr has not been found. John Junior is the only child of John Senior that had a female child old enough to be Winnie. The 1830 Darlington County South Carolina Census list 2 females age 5-10. The Henry County Alabama 1840 Census list 1 female age 16-20 which I believe to be Winnie. Her Grave Stone simply says " In Memory of Winnie Riley " with birth and death dates. Also, her sister Mary Riley ward named her first child "Winifred". 2. ii. MARY RILEY, b. 17 Apr 1822, Darlington District, South Carolina; d. 28 Aug 1861, Dale County Alabama. iii. SON RILEY, b. Abt. 1828, Darlington District, South Carolina. 2. 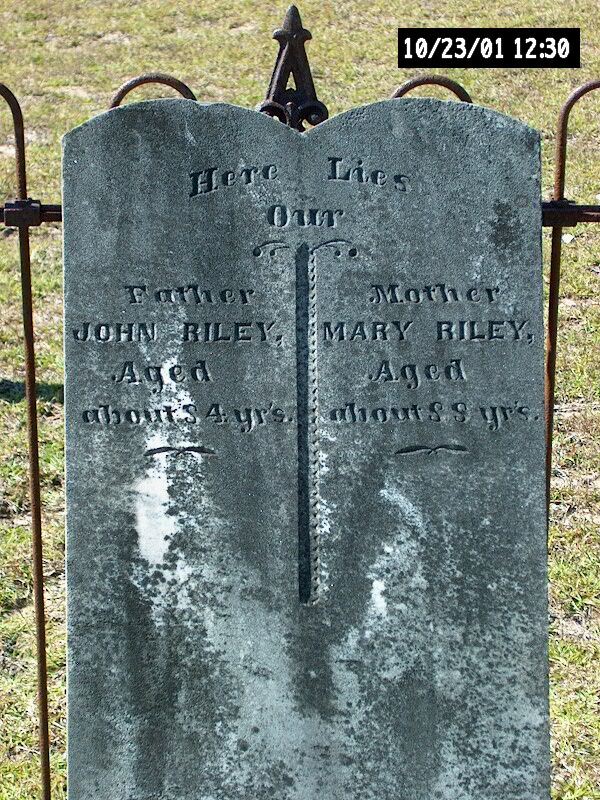 MARY7 RILEY (JOHN6, JOHN5, EDWARD4, WILLIAM3, EDWARD2, EDWARD1) was born 17 Apr 1822 in Darlington District, South Carolina, and died 28 Aug 1861 in Dale County Alabama. She married JOHNATHAN WARD Abt. 1839 in Dale County Alabama. He was born 23 Apr 1811 in Darlington District, South Carolina, and died 13 Oct 1868 in Henry County Alabama. 3. i. WINIFRED8 WARD, b. 26 Jan 1840, Dale County Alabama; d. 22 Apr 1924. 4. ii. JOHN JACKSON WARD, b. 19 May 1842, Dale County Alabama; d. 03 Apr 1890.
iii. MARY WARD, b. 24 Jan 1844, Dale County Alabama; d. 08 Jun 1854, Dale County Alabama. 5. iv. THOMAS WARD, b. 08 Jan 1845, Dale County Alabama; d. 14 Jun 1920, Dale County Alabama. 6. v. WILEY F. WARD, b. 09 Jul 1857, Dale County Alabama; d. 10 Jul 1925, Dale County Alabama. 3. WINIFRED8 WARD (MARY7 RILEY, JOHN6, JOHN5, EDWARD4, WILLIAM3, EDWARD2, EDWARD1) was born 26 Jan 1840 in Dale County Alabama, and died 22 Apr 1924. She married AMOS GILMORE CHANCEY, JR 31 Jan 1862 in Dale County Alabama, son of THOMAS CHANCY and POLLY. He was born 11 Dec 1842 in Alabama, and died 01 Mar 1924.
i. MARY ANN9 CHANCEY, b. 19 Jan 1863, Dale County Alabama; d. Abt. 1865, Dale County Alabama. ii. ANNER CHANCEY, b. 17 Aug 1865, Dale County Alabama; d. 13 Jul 1887, Dale County Alabama. iii. HARRISON T. CHANCEY, b. 18 May 1867, Dale County Alabama. 7. iv. JONATHAN BRINKLEY CHANCEY, b. 03 Jan 1869, Dale County Alabama; d. 13 Jun 1953, Dale County Alabama. 8. v. IDEN CAMELLA CHANCEY, b. 14 Oct 1870, Dale County Alabama; d. 25 Sep 1933, Dale County Alabama. vi. A .L. CHANCEY, b. 15 Dec 1872, Dale County Alabama; d. 16 Dec 1872.
vii. L. L. CHANCEY, b. 15 Sep 1872, Dale County Alabama; d. 17 Sep 1872. 9. viii. JOHN C. CHANCEY, b. 14 Sep 1873, Dale County Alabama; d. 26 May 1916, Henry County Alabama. ix. MARTHA D. CHANCEY, b. 20 May 1876, Dale County Alabama. 10. x. DELLA CHANCEY, b. 20 May 1878, Dale County Alabama. 11. xi. LUCINDA ISABELLE CHANCEY, b. 25 Mar 1880, Echo, Dale County Alabama; d. 21 Aug 1972, Headland, Henry County Alabama. xii. SOLOMON W. CHANCEY, b. 05 Feb 1880, Dale County Alabama; d. 24 May 1884.
xiii. LULEY CHANCEY, b. 18 Mar 1882, Dale County Alabama; d. 17 Jun 1885. 12. xiv. ARNIE ETHEL CHANCEY, b. 24 Nov 1884, Barbour County Alabama; d. 15 Aug 1960, Dale County Alabama. xv. ESTHER CHANCEY, b. 24 Nov 1884, Barbour County Alabama. 4. JOHN JACKSON8 WARD (MARY7 RILEY, JOHN6, JOHN5, EDWARD4, WILLIAM3, EDWARD2, EDWARD1) was born 19 May 1842 in Dale County Alabama, and died 03 Apr 1890. He married MARY CHANCEY. She was born 1848, and died 02 Oct 1902.
i. CHARLES9 WARD, b. 17 Jul 1868. 13. ii. HENRY J. WARD, b. 12 Jan 1871, Alabama. iii. SON WARD, b. 1873; d. 24 Aug 1902. 5. THOMAS8 WARD (MARY7 RILEY, JOHN6, JOHN5, EDWARD4, WILLIAM3, EDWARD2, EDWARD1) was born 08 Jan 1845 in Dale County Alabama, and died 14 Jun 1920 in Dale County Alabama. He married ANZILLA GALLOWAY 15 Nov 1869 in Henry County Alabama, daughter of EDWARD GALLOWAY and ELIZABETH WOODHAM. She was born 18 May 1850 in Dale County Alabama, and died 13 Jun 1930 in Dale County Alabama. Thomas served in Company D, 57th Alabama Infantry Regiment, CSA. He was parolled at Greensboro North Carolina at the end of the War. 14. i. JAMES HARDEE9 WARD, b. 17 Sep 1871, Dale County Alabama; d. 29 Dec 1948. 15. ii. MONROE WARD, b. 05 Aug 1873, Dale County Alabama; d. 1929. 16. iii. MARY EUDORA WARD, b. 12 Mar 1877, Dale County Alabama; d. 01 Jan 1949. 17. iv. CHELLIE ANNIE WARD, b. 05 Jan 1880, Dale County Alabama; d. 12 Aug 1937.
v. OLLIE WARD, b. 25 Apr 1886, Dale County Alabama; d. 28 Apr 1890, Dale County Alabama. vi. MOULTON E. WARD, b. 10 Sep 1888, Dale County Alabama; d. 29 Sep 1890.
vii. ALVAH S. WARD, b. 23 Dec 1891, Dale County Alabama; d. 01 Mar 1897. 6. WILEY F.8 WARD (MARY7 RILEY, JOHN6, JOHN5, EDWARD4, WILLIAM3, EDWARD2, EDWARD1) was born 09 Jul 1857 in Dale County Alabama, and died 10 Jul 1925 in Dale County Alabama. He married (1) OCTAVIA TAVIE BOOTH 25 Dec 1887 in Dale County Alabama, daughter of J.M. BOOTH. She was born 24 Jul 1865 in Dale County Alabama, and died 05 Sep 1897 in Dale County Alabama. He married (2) MARY JANE CLARK 29 Mar 1905 in Dale County Alabama, daughter of WILLIAM CLARK and MARY LISENBY. She was born 16 Dec 1878 in Dale County Alabama, and died 29 Oct 1947 in Dale County Alabama. 18. i. DAISY D.9 WARD, b. 24 Sep 1885, Echo, Dale County Alabama; d. 01 Sep 1940, Echo, Dale County Alabama. 19. ii. LILLIE DALE WARD, b. 10 Jul 1890, Echo, Dale County Alabama; d. 1969, Echo, Dale County Alabama. iii. PASTORIE WARD, b. 19 Sep 1892.
iv. SAMSON9 WARD, b. 22 May 1906, Dale County Alabama; d. 1907, Dale County Alabama. 20. v. JESSE TITUS WARD, b. 18 Oct 1907, Dale County Alabama; d. 05 Aug 1978.
vi. JOHNATHAN W. WARD, b. 21 Jul 1910, Dale County Alabama; d. 04 Jul 1989.
vii. THOMAS WARD, b. 30 Mar 1913, Dale County Alabama; d. 07 Oct 1931, Dale County Alabama. 21. viii. JOSHUA WARD, b. 16 Feb 1915, Dale County Alabama; d. 30 Nov 1990, Dale County Alabama. ix. JAMES WARD, b. 25 Jan 1917, Dale County Alabama; d. 16 Jan 2002, Ozark, Dale County Alabama. x. RUTH WARD, b. 1921, Dale County Alabama. 7. JONATHAN BRINKLEY9 CHANCEY (WINIFRED8 WARD, MARY7 RILEY, JOHN6, JOHN5, EDWARD4, WILLIAM3, EDWARD2, EDWARD1) was born 03 Jan 1869 in Dale County Alabama, and died 13 Jun 1953 in Dale County Alabama. He married ARGENT MALISSIA RILEY 29 Nov 1891 in Dale County Alabama, daughter of WILLIAM RILEY and MARY ROGERS. She was born 10 Sep 1874 in Henry County Alabama, and died 27 Aug 1936 in Dale County Alabama. 22. i. MELISSA MALLIE10 CHANCEY, b. 06 Apr 1893, Dade City, Pasco County Florida; d. 30 Aug 1960. 23. ii. HURLEY B. CHANCEY, SR, b. 10 Feb 1895, Henry County Alabama; d. 14 Nov 1978, Memphis, Shelby County Tennessee. 24. iii. LESSIE BELL CHANCEY, b. 29 Jul 1901, Dale County Alabama; d. 23 Sep 1989, Dale County Alabama. 25. iv. LUTHER WILLIAM CHANCEY, b. 28 Oct 1907, Dale County Alabama; d. 07 Mar 1976. 26. v. OSSIE ELIZABETH CHANCEY, b. 23 Oct 1910, Henry County Alabama; d. 1979. 27. vi. AMOS ESTO CHANCEY, b. 16 Aug 1913, Dale County Alabama; d. 31 Dec 1981. 8. IDEN CAMELLA9 CHANCEY (WINIFRED8 WARD, MARY7 RILEY, JOHN6, JOHN5, EDWARD4, WILLIAM3, EDWARD2, EDWARD1) was born 14 Oct 1870 in Dale County Alabama, and died 25 Sep 1933 in Dale County Alabama. She married ROBERT IVEY RILEY 21 Aug 1889 in Henry County Alabama, son of WILLIAM RILEY and MARY ROGERS. He was born 03 Mar 1870 in Dale County Alabama, and died 01 Apr 1942 in Dale County Alabama. 28. i. CLEONE CLENNIE10 RILEY, b. 05 Jun 1890, Henry County Alabama; d. 10 Dec 1978, Dade City, Pasco County Florida. 29. ii. SUSAN CLAIRE RILEY, b. Apr 1893, Henry County Alabama. 30. iii. AZZIE PATE RILEY, b. 04 Jan 1897, Dale County Alabama; d. 14 Feb 1966, Donalsonville, Seminole County Georgia. iv. PARKIE C. RILEY, b. 1904, Henry County Alabama. 9. JOHN C.9 CHANCEY (WINIFRED8 WARD, MARY7 RILEY, JOHN6, JOHN5, EDWARD4, WILLIAM3, EDWARD2, EDWARD1) was born 14 Sep 1873 in Dale County Alabama, and died 26 May 1916 in Henry County Alabama. He married TEMPERANCE V. RILEY 24 Feb 1895 in Dale County Alabama, daughter of JAMES RILEY and EMILY MELVIN. She was born 13 Jun 1875 in Dale County Alabama, and died 11 Feb 1950 in Henry County Alabama. 31. i. VERA L.10 CHANCEY, b. 03 Dec 1895; d. 13 Jun 1983. 32. ii. VINNIE CHANCEY, b. 12 Apr 1899, Newville, Henry County Alabama; d. 13 Apr 1989. 33. iii. ERRY B. CHANCEY, b. 15 Dec 1901; d. Dec 1929, Coffee County Alabama. iv. STERLING STURLY CHANCEY, b. 02 May 1907; d. 16 Aug 1916, Henry County Alabama. 34. v. HARZEY C. CHANCEY, b. 04 Sep 1912; d. 23 Sep 2001. 10. DELLA9 CHANCEY (WINIFRED8 WARD, MARY7 RILEY, JOHN6, JOHN5, EDWARD4, WILLIAM3, EDWARD2, EDWARD1) was born 20 May 1878 in Dale County Alabama. She married JAMES KELLUM 24 Dec 1898, son of ELIJAH KELLUM and ELIZA. He was born 30 May 1869.
i. UNA10 KELLUM, b. 10 Jul 1901.
ii. BRUNER KELLUM, b. Aug 1903.
iii. OLLIE KELLUM, b. 16 Dec 1906. 11. LUCINDA ISABELLE9 CHANCEY (WINIFRED8 WARD, MARY7 RILEY, JOHN6, JOHN5, EDWARD4, WILLIAM3, EDWARD2, EDWARD1) was born 25 Mar 1880 in Echo, Dale County Alabama, and died 21 Aug 1972 in Headland, Henry County Alabama. She married JOSEPH HENRY WOODHAM 23 Dec 1897 in Dale County Alabama, son of NEEDHAM WOODHAM and ELIZA DEAL. He was born 21 Oct 1874 in Echo, Dale County Alabama, and died 22 Jan 1955 in Echo, Dale County Alabama. i. PILLIE10 WOODHAM, b. 11 Oct 1898.
ii. LILLIE WOODHAM, b. 28 Feb 1906. 12. ARNIE ETHEL9 CHANCEY (WINIFRED8 WARD, MARY7 RILEY, JOHN6, JOHN5, EDWARD4, WILLIAM3, EDWARD2, EDWARD1) was born 24 Nov 1884 in Barbour County Alabama, and died 15 Aug 1960 in Dale County Alabama. She married WILLIAM EDWARD (BUD) RILEY 07 Sep 1902 in Dale County Alabama, son of JAMES RILEY and EMILY MELVIN. He was born 14 Feb 1879 in Dale County Alabama, and died 04 Feb 1964 in Newville, Henry County Alabama. i. BARNARD V.10 RILEY, b. 09 Aug 1903, Houston County Alabama; d. 09 Jul 1965; m. LENA MAE SIMMONS, 27 Aug 1927, Clayton, Barbour County Alabama; b. 21 Nov 1905; d. 13 Feb 2003. 35. ii. VERNON RILEY, b. 05 Apr 1906, Dale County Alabama; d. 04 Jun 1977, Dothan, Houston County Alabama. iii. FRANCES RILEY, b. 15 Oct 1913, Dale County Alabama; d. 14 Sep 1916, Dale County Alabama. 36. iv. LOLA RUTH RILEY, b. 14 Sep 1916, Dale County Alabama; d. 06 Dec 1977, Dothan, Houston County Alabama. 13. HENRY J.9 WARD (JOHN JACKSON8, MARY7 RILEY, JOHN6, JOHN5, EDWARD4, WILLIAM3, EDWARD2, EDWARD1) was born 12 Jan 1871 in Alabama. He married ELIZA A. RILEY 28 Mar 1895 in Henry County Alabama, daughter of ABRAHAM RILEY and DILLIE GALLOWAY. She was born 20 Jun 1875 in Dale County Alabama. i. MINNIE IODA10 WARD, b. 28 Jan 1897, Dale County Alabama. ii. CONSIE E. WARD, b. 26 Oct 1898, Dale County Alabama. iii. FOY WARD, b. 28 Jun 1900, Dale County Alabama. iv. DENNIS DONISE WARD, b. 17 May 1902, Dale County Alabama; m. MATTIE BIVINS, 1922; b. 1904.
v. ESAU WARD, b. 28 Feb 1905, Dale County Alabama; d. 1907.
vi. MITTIE WARD, b. 01 Apr 1907, Dale County Alabama; d. 08 Mar 1908.
vii. INFANT WARD, b. 1909, Dale County Alabama; d. 1909. 14. JAMES HARDEE9 WARD (THOMAS8, MARY7 RILEY, JOHN6, JOHN5, EDWARD4, WILLIAM3, EDWARD2, EDWARD1) was born 17 Sep 1871 in Dale County Alabama, and died 29 Dec 1948. He married (1) IDA LILLIE MIMS, daughter of ROBERT MIMS and SARAH BRANNON. She was born 19 Aug 1905. He married (2) ERMA HAY 10 May 1907.
i. PATRICIA 'PATSY'10 WARD, b. 08 Dec 1931; m. JAMES JOSEPH CONNERS, 19 Mar 1971. 15. MONROE9 WARD (THOMAS8, MARY7 RILEY, JOHN6, JOHN5, EDWARD4, WILLIAM3, EDWARD2, EDWARD1) was born 05 Aug 1873 in Dale County Alabama, and died 1929. He married FRANCES D. RILEY 11 Feb 1897 in Dale County Alabama, daughter of JOSEPH RILEY and SARA JOHNSON. She was born 14 Nov 1878 in Dale County Alabama, and died 1961.
i. TALBOT10 WARD, b. 02 Dec 1897; d. 21 Dec 1897.
ii. BIRMA LEON WARD, b. 12 May 1899; m. DAISY. iii. J. BEE WARD, b. 26 Dec 1902; m. JOYCE MORGAN. iv. INFANT WARD, b. 21 Jul 1904, Dale County Alabama; d. 21 Jul 1904, Dale County Alabama. v. ERMA WARD, b. 01 Jul 1908.
vi. ANNIE WARD, b. 1911; m. HARRY GRUBB. 16. MARY EUDORA9 WARD (THOMAS8, MARY7 RILEY, JOHN6, JOHN5, EDWARD4, WILLIAM3, EDWARD2, EDWARD1) was born 12 Mar 1877 in Dale County Alabama, and died 01 Jan 1949. She married WILLIAM ROBERT WIGGINS. He was born 13 May 1865, and died 28 Jun 1945. 37. i. OLLIE10 WIGGINS, b. 20 Sep 1912, Dale County Alabama. ii. WILLIAM FREEMONT WIGGINS, b. 21 Nov 1913, Dale County Alabama; d. 19 Apr 1945, KIA, WW-II Okinawa. 38. iii. LLOYD THOMAS WIGGINS, b. 1915, Dale County Alabama. 39. iv. MARY ELIZABETH WIGGINS, b. 1917, Dale County Alabama. 17. CHELLIE ANNIE9 WARD (THOMAS8, MARY7 RILEY, JOHN6, JOHN5, EDWARD4, WILLIAM3, EDWARD2, EDWARD1) was born 05 Jan 1880 in Dale County Alabama, and died 12 Aug 1937. She married HENRY MORGAN HUNT 19 Feb 1903 in Dale County Alabama, son of DANIEL HUNT and MARY WARD. He was born 28 Mar 1878 in Echo, Dale County Alabama, and died 26 Oct 1971 in Echo, Dale County Alabama. 40. i. DORA LEE10 HUNT, b. 28 Jan 1907, Dale County Alabama. ii. GERALD HUNT, b. 1907, Dale County Alabama; d. 1907, Dale County Alabama. iii. JAMES M. HUNT, b. 26 Dec 1908, Dale County Alabama; d. 19 Jul 1918, Dale County Alabama. 41. iv. NELLIE MAE HUNT, b. 18 Sep 1912. 42. v. MARY ANZILLA HUNT, b. 25 Mar 1915, Dale County Alabama; d. 25 Jun 1989, Echo, Dale County Alabama. 18. DAISY D.9 WARD (WILEY F.8, MARY7 RILEY, JOHN6, JOHN5, EDWARD4, WILLIAM3, EDWARD2, EDWARD1) was born 24 Sep 1885 in Echo, Dale County Alabama, and died 01 Sep 1940 in Echo, Dale County Alabama. She married ZINNAMON SOLLY WOODHAM 17 Nov 1904 in Dale County Alabama, son of NEEDHAM WOODHAM and ELIZA DEAL. He was born 20 May 1884 in Echo, Dale County Alabama, and died 17 Nov 1957 in Echo, Dale County Alabama. i. BELL10 WOODHAM, b. 07 Mar 1912, Dale County Alabama; d. 02 Jul 1999; m. FLETCHER SEWELL, 05 Nov 1932; b. 11 Nov 1910; d. 19 Jan 1995.
ii. SIMMIE M. WOODHAM, b. 15 May 1917, Dale County Alabama; d. 22 Aug 1997; m. RAY R. MILLER, 16 Dec 1939; b. 23 Dec 1912; d. 07 Apr 1981. 19. LILLIE DALE9 WARD (WILEY F.8, MARY7 RILEY, JOHN6, JOHN5, EDWARD4, WILLIAM3, EDWARD2, EDWARD1) was born 10 Jul 1890 in Echo, Dale County Alabama, and died 1969 in Echo, Dale County Alabama. She married AARON THOMAS LINDSAY 10 Mar 1916 in Dale County Alabama, son of AMBROSE LINDSAY and SALLY ARD. He was born 09 Dec 1862 in Henry County Alabama, and died 17 Apr 1944 in Bonifay, Holmes County Florida. i. MARVIN DEE10 LINDSAY, b. 27 Aug 1914, Dale County Alabama; d. Feb 1972, Crestview, Okaloosa County Florida. ii. JANE M. LINDSAY, b. 1918, Dale County Alabama. iii. THADY B. LINDSAY, b. 09 Mar 1921, Dale County Alabama; d. Dec 1983, Ozark, Dale County Alabama. iv. RAYMOND L. LINDSAY, b. 12 Apr 1922, Dale County Alabama; d. 30 Dec 1995, Ozark, Dale County Alabama. v. WILEY LINDSAY, b. 05 Sep 1924, Dale County Alabama; d. 13 Apr 1953, Marianna, Jackson County Florida. vi. OCTAVIA L. LINDSAY, b. 1929, Dale County Alabama. 20. JESSE TITUS9 WARD (WILEY F.8, MARY7 RILEY, JOHN6, JOHN5, EDWARD4, WILLIAM3, EDWARD2, EDWARD1) was born 18 Oct 1907 in Dale County Alabama, and died 05 Aug 1978. He married TERA SEWELL 1928. She was born 1911 in Dale County Alabama. i. EUGENE10 WARD, b. 1928, Dale County Alabama. 21. JOSHUA9 WARD (WILEY F.8, MARY7 RILEY, JOHN6, JOHN5, EDWARD4, WILLIAM3, EDWARD2, EDWARD1) was born 16 Feb 1915 in Dale County Alabama, and died 30 Nov 1990 in Dale County Alabama. He married MATTIE LEE PEACOCK 10 Dec 1938 in Dale County Alabama, daughter of FITZHUGH PEACOCK and ROBERTA NEWTON. She was born 10 Jan 1917 in Dale County Alabama, and died 09 Oct 1993 in Dale County Alabama.